Center for Inner Resources Development - North America invites you to Experience the Yoga of Knowledge by attending Spiritually Enlightening events in Southern California and Washington Metro Area. 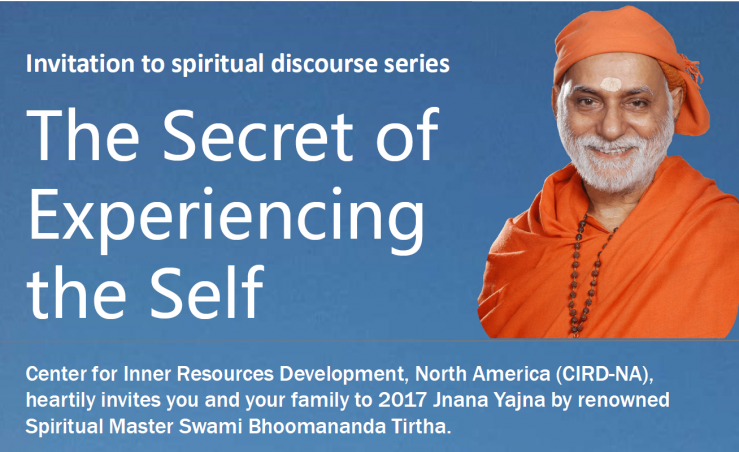 NORTHERN VA, Va. - Aug. 19, 2017 - PRLog -- Renowned Spiritual Master Poojya Swami Bhoomananda Tirtha (Swamiji) will be conducting a series of discourses and workshops in the USA. Programs in Southern California will be held from September 5 - 14, 2017, while in the Washington Metro Area they will be held from August 30 – September 3, 2017, & September 16 - 25, 2017. Poojya Swamiji will be accompanied by Sannyasin Disciples Swami Nirviseshananda Tirtha and Ma Gurupriya. We would like to invite everyone to take this opportunity to be inspired and rejuvenated by the spiritual wisdom Swamiji will share during these programs. Swami Bhoomananda Tirtha, a preeminent Indian Saint, is distinguished for his lucid and profound dissemination of Vedantic wisdom. 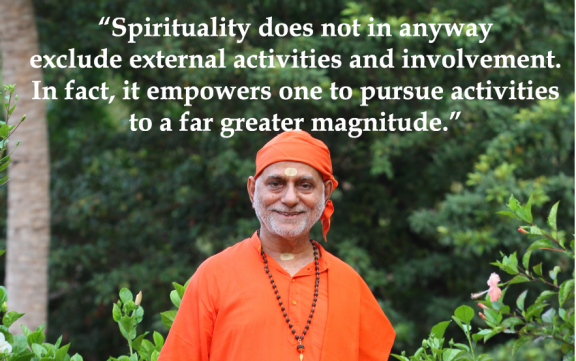 As a Self-Realized Master of Parama Vidya (Ultimate Knowledge), Swami Bhoomananda Tirtha has transformed the lives of innumerable seekers on the spiritual path. During the first phase of 2017 Jnaana Yajna, under the inspiration and guidance of Poojya Swami Bhoomananda Tirtha, Center for Inner Resources Development (CIRD), North America, California will be organizing 2017 Global Bhagavad Gita Convention on September 9 - 10, 2017 in the Crystal Cove Auditorium, University of California, Irvine, CA. All are welcome to this unique event that will feature a diverse spectrum of distinguished speakers. Visit http://www.globalgita.org for detailed program schedule and registration options. Programs will give an opportunity for participants to understand the spiritual truth at a deeper personal level. Attendees will find how spiritual wisdom enriches and empowers their inner personality in every walk of life, enabling each to assimilate all impacts from the world and thereby get elevated and expanded every time. This will be an excellent opportunity for householders, executives, young professionals, managers, students and entrepreneurs to learn about applying spiritual practices to empower and enrich one's personal and professional lives. All programs are free and everyone is heartily invited to attend.